Always with nice combos.. i like most the first dress from shein... the bag give it a pop of color that i like... have a wonderful weekend..
Yep, the relaxed fit ones seem to fit me better, otherwise I have to size up. I didn't buy anything in the January sales surprisingly! Happy Friday Mica! You look absolutely stunning! The dash of red compliments both dresses beautifully. I pray that you and your family have a great weekend! Dear Mica, I love both looks - I'm generally a huge fan of navy and together with red this is simply the perfect combination. And it happens to me as well as I change an outfit I had already planned :) Thanks for the inspirations, I'm not surprised you got that many compliments for the first dress! Navy and red bag makes such a great combo! Have a lovely weekend. These are both really pretty on you, but the first one is my favourite. I'm glad you kept the accessories minimal, as the dress is a stunner on its own...as are you! Thanks Sheila! It's such a nice dress, I'm already thinking of another time to wear it! Happy Friday Mica!You look very gorgeous and both the outfit are stunning. Love the boho chic you're working with both these dresses and that is such an eye catching bag in both color and detail! Happy weekend Mica! Your new dress looks great on you Mica. I love that style dress and the print is very pretty! You know I love the second one as well. Glad it all worked out. absolutely stunning. your first outfit is just gorgeous. I love the print of your new Shein dress. Both of these look so great with your red bag! Both dresses are gorgeous, Mica! This year I will start to wear more dresses too or at least try to break away from my usual tee and shorts. I am not a huge fan of navy, but I do love red. And yes, a dress is always too short when you are running after the kids! Unless it's a maxi dress of course, haha! Oh I LOVE that bag Mica!! The color is so fun, and I especially love how it pops with that first dress. You can never go wrong with a printed dress with a pop of color. Have a great weekend! The print on both of these dresses is gorgeous, but the first one is my favourite! Dresses are really my fave because they are so easy!! These are both wonderful but I'm in love with that navy flower print one!! AND that bag!! That first dress is just stunning. I am so in love with that print. Plus the RM bag. Sooo cute. Navy and red are divine together. You can never go wrong! Thank you, it was a bad start to the year with us being unwell! I'm loving the print and color on that dress. It's no wonder you got so many compliments on it! Yep, not the easiest choice when you're with little ones! Oh I love that navy dress from SheIn! I typically order a size larger, but I think you are right, this one is perfect in your typical size. It's just relaxed enough but doesn't add any bulk. I love the design of it too! Hope you had a good week and have a nice weekend! You look so good in blue Mica. The first dress looks amazing and that red bag is just gorgeous. That she in dress is so lovely! I love how you styled it! You're right, medium would be too big because of the loose fit of the dress. Small looks perfect on you. I always the oversized chic and this dress has that flowly movement to it. The Zara dress is also very pretty. You look beautiful in both. I feel like dresses are the perfect way for us to look dressed up, feminine and cute! Oh my! What pretty dresses. I really love the first one! The print is gorgeous! This is so cute! I'm loving the pop of red from your bag! I really love your Shein dress! The print is so perfect and it creams summer. 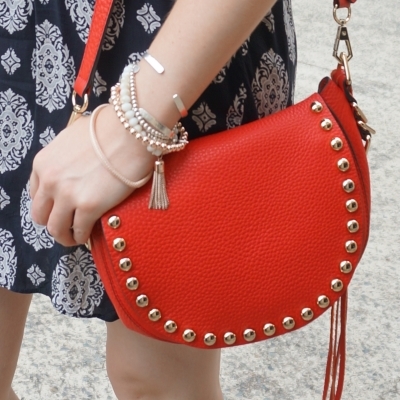 It also looks great with the red Rebecca Minkoff bag! That dress is so pretty! And I love your bag! I love the heart pendant! How fun! Those are two pretty dresses! I like the first tunic dress, very pretty and effortlessly chic! You look gorgeous! That dress really fits you, dear! I really love that SheIn dress and I am glad you went with the small size, I love the length and the looser fit. It's so hard when some of the reviewers say it fits true to size and others say it is too big. But, you made the right choice! That red bag is beautiful, I need to get my red bag out more! Yes it definitely had mixed reviews, I'm glad I didn't order the larger size as it would have been much too big! Ok so I think the Shein navy flower print flowy dress is one my most favourite outfits of yours Mica! Dresses that are a bit baggy can be so unflattering but this one is perfect - and great for swishing about it! Gah, I can't wait till it's Summer in the UK and to not be wrapped up in jeans! Blogging definitely affects my choice of clothing too. 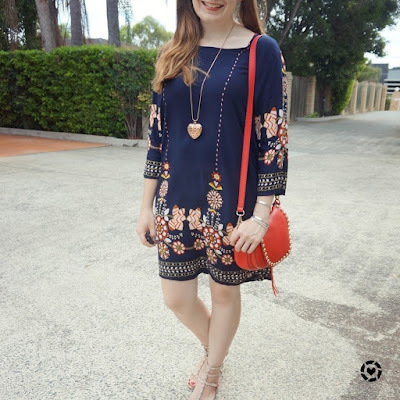 I adore that navy blue Shein dress and the red bag is an absolute eye candy! Both dresses a win for me because they are shift dresses, one can never go wrong with shift dresses. I however love the first dress more because of the color and the print. That Rebecca Minkoff saddle bag is everything and it matches both looks to perfection. Greetings from Nairobi! 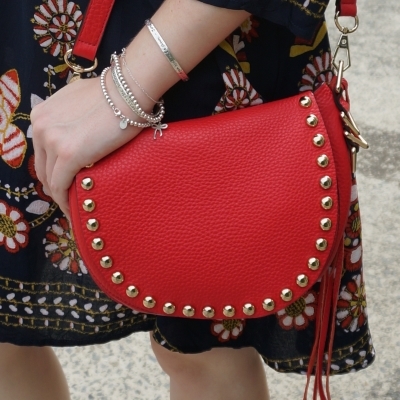 Love seeing how you styled the red bag with different prints! I'm looking for a crossbody, and was debating between a statement red bag, or those with a ton of embroidery on them, so I like seeing how people pair up their purse with their outfit (that isn't all black, lol). Love both of these looks! That red bag is gorgeous and the print on both dresses are so pretty! Visiting from Modest Mom Link Up... Your rose gold necklace is very pretty. It goes so well with navy, doesn't it? I recently ordered a rose gold necklace and earrings, and they are my new favorites! Yes, it's definitely rare but welcome!